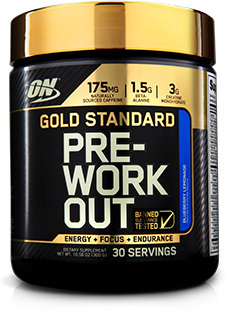 Gold Standard Pre-Workout by Optimum Nutrition at Bodybuilding.com - Best Prices on Gold Standard Pre-Workout! 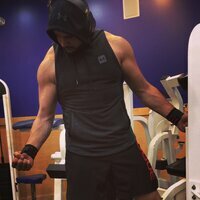 I train 6 times a week at an intense level, now more that I am cutting body fat. This preworkout is my second and the effect was very good lasting my whole training session (approximately, 2 hours 25 minutes) without any crash/tiredness feeling. Much preferred in comparison to BSN NO XPLODE, for efficiency and taste. Will be buying again. Not sure if I'm immune to the affects of caffeine or what (I'm a barista.. drink a lot of coffee) but I felt relatively no difference and still struggled to get thru my workout energy wise. Taste was ok - not bad not great. Will try again and see but so far I am unsure. good preworkout for money... 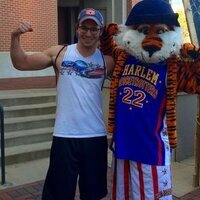 I came from using Jym Pre which has many more supplements which leads to a much higher cost. I wanted to try a cheaper alternative to test results and I am happy with the results I'm seeing. The only thing I would recommend is also buying creatine to add to this as I didn't feel I was getting all the recovery/endurance I should have. With the added creatine it is a very good product. Everything I need for my activities. Rate it as a "Best"! Mixes with water well. I workout early in the morning and AM NOT A MORNING PERSON. Within 20 minutes I am focused and have the energy I need. There are no crazy gitters or racing heart. Love this product. Blueberry lemonade tastes awesome! It mixes well with water unlike others pre-workouts I’ve used. I usually take this at 5 pm before my workout and I have no issues with sleeping. 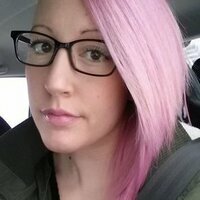 Good job ON! I decided to try this just for a different pre-workout. Taste is better than other products I have tried. This seems to stay with you through the workout a little better than other products. 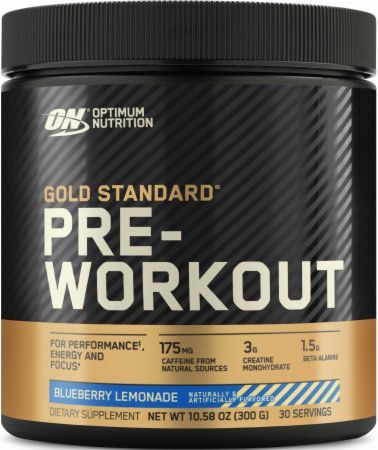 After bouncing around from pre workout to pre workout trying to find something that I found both effective and tastes good I finally found both in ON Gold Standard Pre workout. I would recommend giving it the 30 minute window to kick in but when it does I usually can hit all my heavy lifts effectively right away and still have energy left over to do some higher rep lifts. Hands down the Blueberry Lemonade is the best tasting pre workout that I've every had. It's tart, sweet, tasty and hits the spot when ice cold right before a hard workout! Highly recommended! 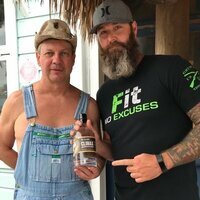 It’s a good per workout drink, good taste, mix well. I love this pre. kicks in quickly and gives me the focus and energy needed to push through an intense workout. no jitters, no crash. i recommend to everyone. I have been using this for a few weeks and I notice modest improvements during my workouts and distance runs. I've taken some other pre's that give me too much energy it's uncomfortable (as a bipolar person it can be challenging to find the right balance). I find this one gives me the right amount of focus and endurance, as well as a more stable energy for when I want to push myself. I tend to use ON supplements because they seem to incorporate vitamins and other things that help your body in other ways too. I realize many people want a huge pre-workout boost - this is not the rocket fuel one, so if that's what you're looking for I would not recommend this. However if you're like me and you want something more middle of the road for overall wellness - this one is a great one to try out. Mixability is good, and flavor is pretty sour. Really gets you going, but gives you itches and a massive crash afterwards. For the price, i would not buy it again. 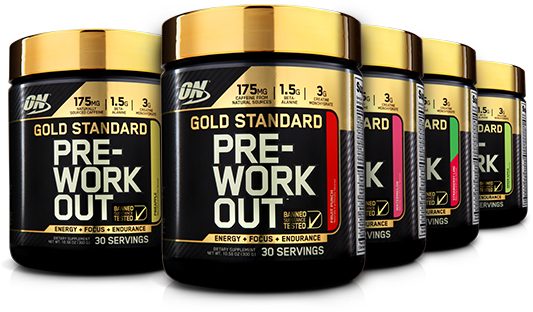 Directions For Gold Standard Pre-Workout: Mix each scoop with 6-8 oz of water and consume 20-30 minutes before training. Start with 1 scoop or less to assess your tolerance. DO NOT EXCEED 2 SCOOPS WITHIN ANY 24 HOUR PERIOD. Warnings: CONSULT YOUR PHYSICIAN BEFORE USING THIS PRODUCT IF YOU ARE TAKING ANY MEDICATIONS OR ARE UNDER A PHYSICIAN’S CARE FOR A MEDICAL CONDITION. NOT FOR USE BY THOSE UNDER THE AGE OF 18, WOMEN THAT ARE PREGNANT, TRYING TO GET PREGNANT, OR NURSING, OR THOSE THAT ARE SENSITIVE TO CAFFEINE, NIACIN OR BETA-ALANINE. DO NOT CONSUME CAFFEINE FROM OTHER SOURCES WHILE TAKING THIS PRODUCT AS TOO MUCH CAFFEINE MAY CAUSE NERVOUSNESS, IRRITABILITY, SLEEPLESSNESS, AND OCCASIONALLY RAPID HEARTBEAT. BETA-ALANINE AND NIACIN MAY CAUSE A HARMLESS, TEMPORARY TINGLING OR FLUSHING SENSATION. DO NOT COMBINE WITH ALCOHOL. DO NOT EXCEED 2 SCOOPS WITHIN ANY 24 HOUR PERIOD. CONSUME AS PART OF A HEALTHY DIET AND EXERCISE PROGRAM, AND DRINK AT LEAST 100 OZ OF WATER PER DAY. EXERCISE MAY INCREASE YOUR NEED FOR FLUID INTAKE. KEEP OUT OF REACH OF CHILDREN.